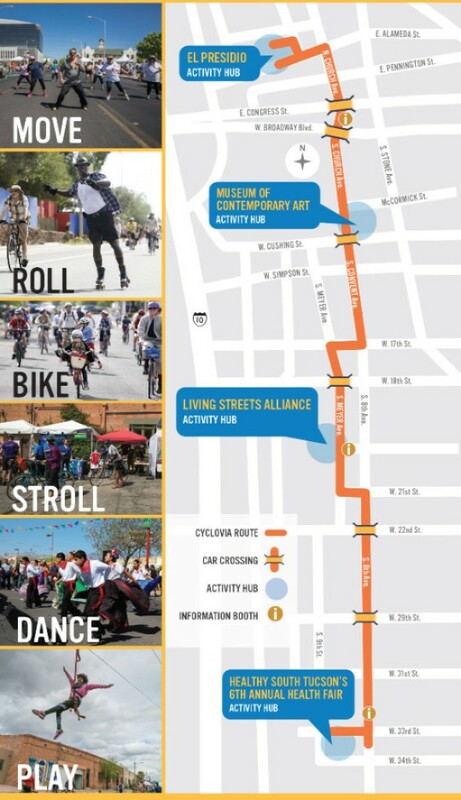 Time to get our your bikes, trikes, scooters, wagons, skates and walking shoes and enjoy the streets of Tucson sans motor vehicles. Enjoy Springtime outdoors. Sunday, October 29, 2017, 10 a.m. to 3 p.m.
All New route – S. 12th Avenue in Tucson. Spent the last 2 hours walking (not bicycling this time) through 2 northern activity hubs, with free admission to TMA (where I saw the Mayor doing a rumb? dance with Wilbur the Wildcat) and then down to MOCA, north of Cushing St. Lots of bikes, trikes, scooters, strollers, even a wheelchair, plus us walkers enjoying the downtown streets today. Lots still to do by 3 p.m. Get out your bike and head downtown. Great spring weather. TMA has a new exhibit called Body Language, depicting humans in different mediums and abilities — some existential, some realistic, some unrealistic. And there’s some treasures on the bottom floor: Rodin, Sisley, Miro.